beautiful hostel , close to the beach. great staff, the hostel was refurbished and everything is new. one of the best hostel i ever stayed ! The place is in a perfect location and the hostel has all the necessary places to feel comfy. I’ll definitely stay there again!! A super clean and super functional hostel. Smells like the accommodation I once lived in UCLA (memorial moment). Right in downtown Santa Monica. Near to the beach and the Santa Monica Pier. People there are nice, but I didn’t found a lot of people to communicate here. It’s quite quiet sometimes. Staffs are nice but they are slow in solving problems. Have to be patient. Definitely recommended. I was traveling with my 13 yr old daughter. The room served its purpose we had separate beds obviously and were housed in a 10 person dorm. Some of the women weren't as clean but that's too be expected in some ways just based on everyone's personal experiences and upbringing. The TV, kitchen and library were always clean and usually empty or with few people. The staff was a hit or miss depending on whom was at the desk and what t. Only major complaint was the deactivation of our room keys daily. SM HI is a really beautiful hostel! Quick walk to the beach & lots of shops and restaurants to explore on foot. My only complaint is with the staff during check in and out. On both occasions I was waiting in line, only to have multiple other guests go up to the side of the staffs desk to ask a “quick question”, which turned out to be services the line was also waiting for. Instead of asking them to get in line, they serviced them, ignoring everyone in line. It was incredibly rude! The best hostel I've been to in regards to infrastructure. Everything is so neat. The location is great. The environment is very quiet. Not your tipical party hostel. 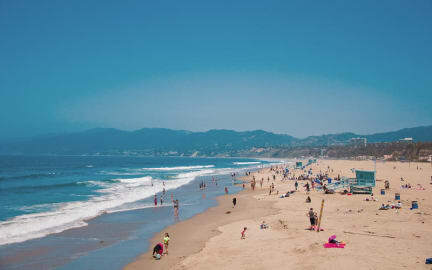 Great place to stay for a couple of nights and a short walk to Santa Monica pier and other cool attractions. Nothing too amazing but would probably stay here again! Spent most of my LA trip being spoiled here being so close to the beach and nice shopping, plus big breakfast, and nice quiet dorms. Plus it’s really clean and felt like a hotel compared to other hostels. Nice sitting area with a fireplace and good comedy shows too. Price is out of budget for me but with limited options, they got me.. I like the hostel. Great location. Good vibe. Amazing people. It all changed the other night when one of the staff slammed the door open at 12pm and turned on all the lights as everyone was sleeping. She then proceed to change the sheets on one of the empty beds banging and slamming things as she went along. This startled me from my sleep. I asked why she was doing this.. She looked at me and said nothing. Very disrespectful. Felt like she didn’t care about anyone other than her self. Excellent communal facilities - the best I’ve experienced. Great location and high quality However, the worst hotel beds I’ve slept in. Uncomfortable and incredibly noisy beds. More than happy to cope with okay beds in a hostel but these were incredibly bad. Unable to get comfortable and every time you or anyone in the room moved there was a huge noise made. The staff are also incredibly difficult and rude. Are happy to try and charge you for anything and aren’t welcoming at all. Such a shame.